In the previous post for our Micro Charts product (currently available for WPF, Silverlight, and WinRT XAML), we finished looking at our heat map control that is able to generate heat map markers that change both in size and color. This allows for representations of two distinct data sets in the same heat map. In today's post, we'll take a look at a new control called MicroBulletGraph coming to Micro Charts in the WPF and Silverlight controls in their 2012.2 versions. 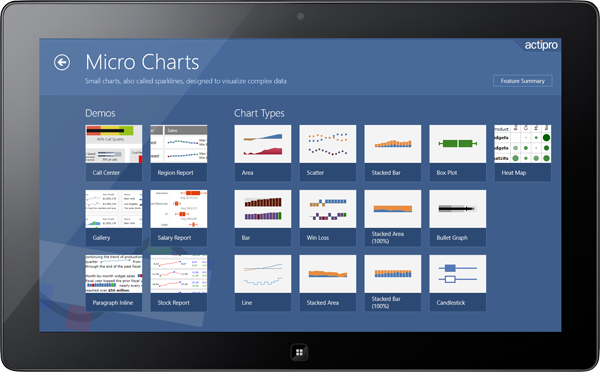 This control is already available in the WinRT XAML 2012.2 version of Micro Charts. UPDATE: Version 2012.2 is live and available for download now. Bullet graphs were originally designed to replace meters and gauges in a more compact way while still being informative. They are best suited to display a value that has other related values to be compared to, such as last year's mark, a goal or target, or a projected future value. With the MicroBulletGraph's many parts, it is easy to provide contextual information about the data being displayed. The actual value is represented by a featured measure bar, which is juxtaposed with a comparative value displayed as a bar perpendicular to it. The featured and comparative values are then placed in the context of specific ranges such as poor, average, and excellent. To give further meaning a projected bar can be used to display a future expected value of the featured bar. In the example above all the parts of the MicroBulletGraph are displayed and labeled. Note that the only required value is the featured value, all others can be omitted, hiding the bar from view. An unlimited number of ranges can be used, or none at all, but bullet graphs most commonly utilize three qualitative ranges. Bullet graphs are incredible tools to help the viewer grasp multiple points of information quickly without seeming cluttered or confusing. In our next post of this series, we'll take a look at appearance customization features. The latest official C# 5.0 and Visual Basic 11.0 language specifications have added some new keywords and functionality to the languages. Both languages add asynchronous procedure support (via async/await) and VB adds iterators. 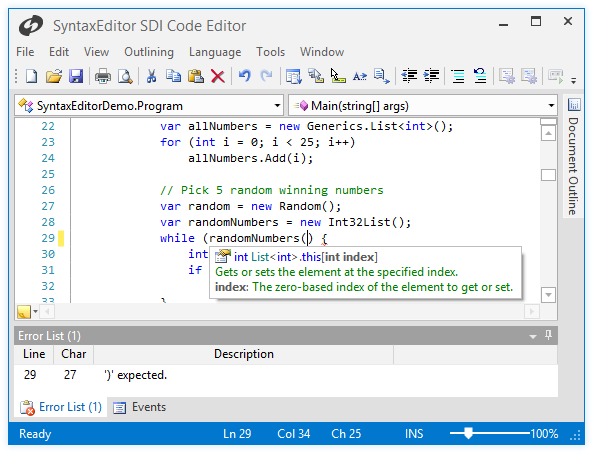 Our upcoming 2012.2 versions of the SyntaxEditor .NET Languages Add-on (WPF and Silverlight versions) have been updated to fully parse the syntax changes and support automated IntelliPrompt on await expression results. Let's take a look at a sample of async/await in action. 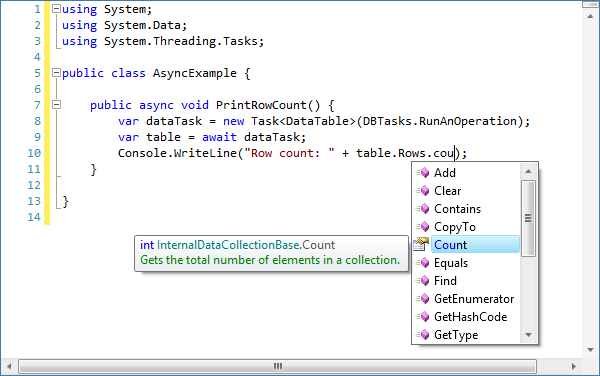 In this sample code snippet, we have a method that will print the row count of a table that is asynchronously returned. Note how all variables are implicitly declared with the var keyword. First we declare a dataTask variable that is a Task<DataTable>. Then we declare a table variable that is the result of an await of the task. A lot of complicated code is going on behind the scenes here. First, in order to determine task's type, the resolver has to search the awaited object (dataTask) for a GetAwaiter method (either explicitly declared or declared via an extension method). If found, it examines that object for a GetResult method and the return value of that is task's type. Finally you can see from the screenshot that it properly determined that table is of type DataTable since we are able to access the Rows collection on it. Our .NET Languages Add-on continues to support the latest syntax innovations and has very impressive automated IntelliPrompt capabilities that can be added to your own applications. The enhancements mentioned above will be included in the upcoming 2012.2 version. Now that we've released our first set of UI controls for Windows 8 apps, our next development priority is to finish off the new controls and features coming to our WPF controls in their 2012.2 version. A complete new theme for the Metro style appearance, inspired by the latest Visual Studio and Office versions. Ability to convert any Window to use a custom chrome like above when the Metro theme is active. Window border color (when active) that matches the StatusBar color. Semi-transparent outer glow effect for window border. Window resizing via the outer glow effect area. StatusBar background, window border, and glow effect colors can all be changed based on app state. Ability to render interop (WinForms, etc.) controls properly, even though transparency is used. We'll get into more details on how all this works in future posts. But trust me, if you want your apps to take on the latest Metro-like appearance, you'll definitely want what's coming. We're very excited for these updates. They will be part of the 2012.2 versions, which should be available in the next several weeks. 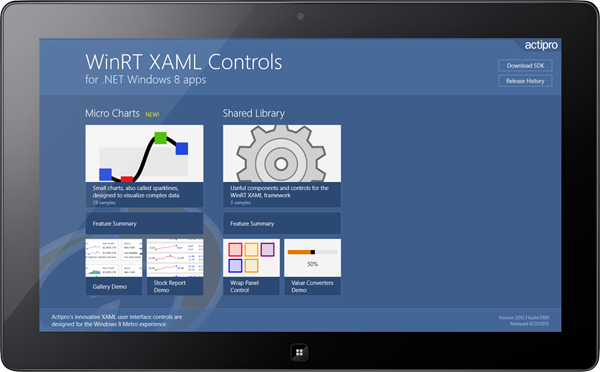 Yesterday we officially released our first WinRT XAML user interface controls! These controls are designed to be used in any .NET-based Windows 8 app and are fully compatible with both the Windows 8 and Visual Studio 2012 RTM versions. This first 2012.2 version includes all of the Micro Charts functionality found in the WPF and Silverlight versions, along with several new micro chart controls that we'll get into soon in upcoming blog posts. These controls are full production-quality and are not a beta product. We are excited to be one of the very first control vendors to release Windows 8 XAML UI controls for C# and VB developers. The download for our WinRT XAML controls includes detailed product documentation and C#/VB Sample Browser app projects that show many sample usage scenarios for the controls. When you first load our Windows 8 Sample Browser app, you'll be presented with a fluid Metro-style user interface for navigating to the many demos and samples we provide. The root page lists each product in its own group and quick access to several featured demos. Clicking or tapping on the large logo item for each product dives down into a detail page for the product. This page contains categorized lists of samples and access to the product's feature summary. Click or tap any sample item to open it. Arrow buttons on the left and right can be used to quickly navigate between samples. You can see in this screenshot, one of our new micro charts controls (bullet graph - also coming to WPF/Silverlight in their 2012.2 versions) in action! With this release of our WinRT XAML control products, we now have a very solid framework and samples infrastructure. This will enable us to continue to expand our control offerings for this platform in the future. After you get a chance to download our WinRT XAML controls and try out the sample, please contact us with your comments. We'd love to hear what you think! 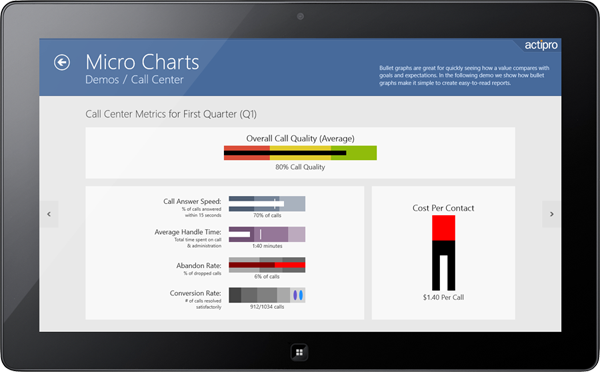 We have been working hard on finishing up our first Windows 8 UI control offerings, which will focus on our Micro Charts product. Our upcoming WinRT XAML controls have been designed to be used with Visual Studio 2012 and fit perfectly into any .NET-based Windows 8 Metro style app. We have full C# and VB sample projects ready to go that show off all the features of the WinRT XAML controls. Visual Studio 2012 designer integration and complete API and usage documentation is included as well. Micro Charts is a set of charts that visualize quantitative data and are designed to render clearly in compact spaces, with common usage scenarios being within dashboards, reports, and grids. Many chart types are supported, from basic line and bar charts to stacked area charts. The chart control includes numerous useful features such as multiple series, stacking, hot tracking, customizable palettes, and data aggregation. Additional micro chart types such as heat maps and other unannounced new additions are included as well. 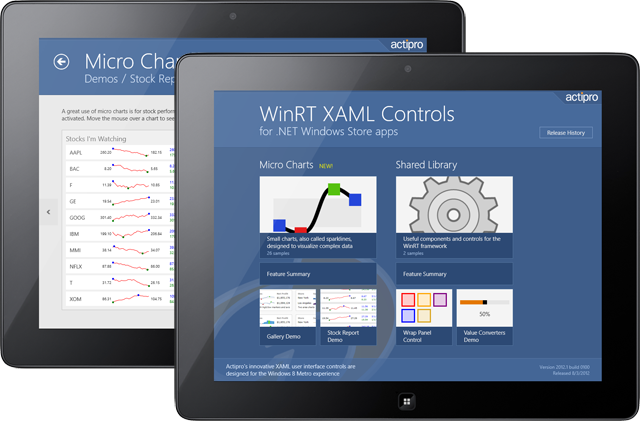 Overall, the WinRT XAML version of the Micro Charts product has the same feature set as our WPF Micro Charts product so be sure to check out that product's web site for more details on what features will be in this product. We are putting the finishing touches on the product at this time, and hope to publicly launch it in the next several weeks. In the meantime, we are looking for some beta testers to help try out the controls and give us feedback on the installation process, run-time product usage, and our samples app design. If you are someone who is seriously looking to use micro charts in your Windows 8 apps, please contact us at our sales address for more information. UPDATE: Our WinRT XAML Controls are live now. Please download an evaluation!